This month for Reading Wildly, my staff and I read sports books. We get a lot of requests for sports books and I know it's a genre that I'm not particularly drawn to, which made this a great month for expanding my horizons! I know some of my staff members felt the same way, but with the variety of books in our collection, everyone found something good to read. One thing Sullivan recommends for booktalks is to have the books available for kids to take immediately. This is especially essential for non-readers who are not likely to expend extra effort to seek out a book. My staff and I had a brainstorming session about how we could make this happen when we booktalk to classes. We thought about possibly purchasing extra copies of books that we frequently like to booktalk and encouraging kids to bring their library cards when we're coming so that we could check books out while we're there. We'll continue to try to figure out a system that works for us! One thing we will definitely do is incorporate booktalks into as many programs as possible this summer! 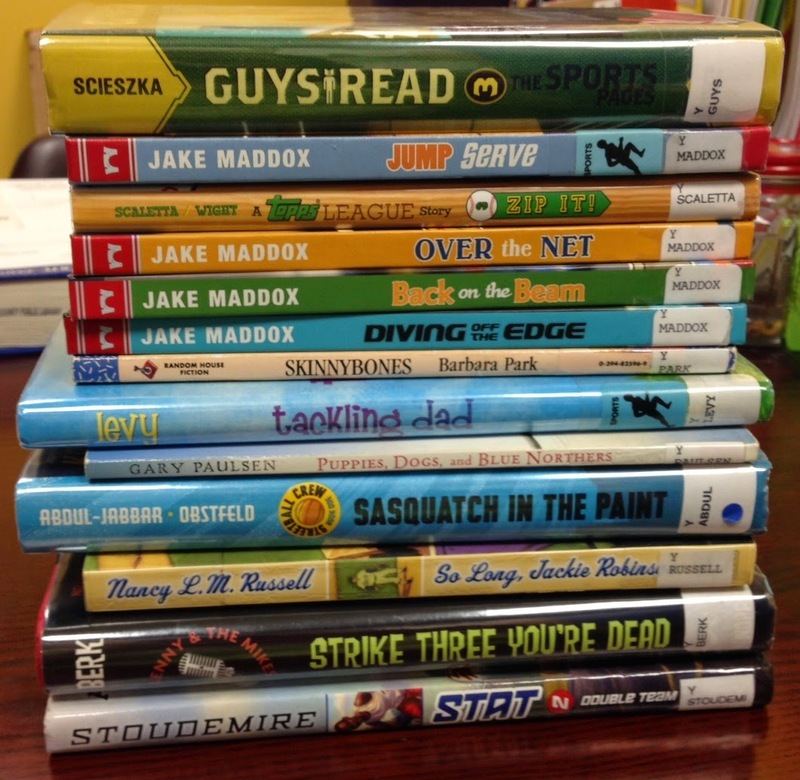 My staff found a variety of books to bring to the table this month, books for younger readers and older readers. There was also a wide variety of different sports discussed, and some books with boy characters and some books with girl characters. Next month, we're talking about multicultural books. We'll start our discussion by talking about the recent New York Times article "The Apartheid of Children's Literature" by Christopher Myers. I also distributed copies of the book list 50 Multicultural Books Every Child Should Know, compiled by the Cooperative Children's Book Center. This is not a required list for our book discussion next month, but it'll give my staff a good starting point if they're not sure what they want to read. I had a great question from one of my library assistants. He asked if our book for next month had to be realistic fiction or if it could be fantasy or another genre. I told him that any genre fiction featuring protagonists of color or from cultures outside the US would be GREAT for us to know about! My question for YOU today has to do with the chapter on booktalking we all read: when you booktalk to groups, are you able to place books in the kids' hands? If you're visiting a group outside the library, how do you make that happen? I do check out books at a book talk. In September (library card month) I share our library's services and promote getting a card. Only readers with library cards can then check out when I book talk throughout the year. I list all the books I take, write name and card number next to title being checked out, enter it when I return to library. Tried using remote checking out but found paper and pen worked easier. Having the list with book barcode on hand helps.